RIO DE JANEIRO, BRAZIL – The Secretary of Public Safety in Rio de Janeiro has received R$1,585,300, in partnership with the Legislative Assembly of Rio de Janeiro (ALERJ), for the civil and military police training of nearly 19,000 officers according to government sources. In the lead-up to the Olympics set to take place in Rio during August 2016, international pressure will grow to increase security, as well as improve on its record of police violence. Rio’s Military Police in Complexo da Maré, photo by André Gomes de Melo/Imprensa RJ. The funds will be directed toward programs for education, professional development, violence prevention, training seminars, and educational materials for both military and civil police agents. A first “Week of Coexistence and Civilian Security,” as well as other activities, is scheduled for November. According to data collected from Secretaries of Public Safety, in 2014 about six people died each day as a result of police violence in Brazil. Specifically, the state of Rio de Janeiro reported 582 deaths last year, although many critics would suggest the numbers are much higher. 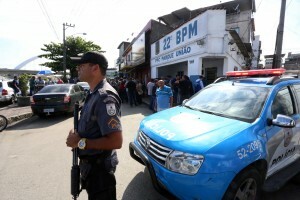 Adding to tension in communities, in August this year certain units of the Rio de Janeiro Military Police (PMRJ) were authorized from the State Secretary of Public Security, José Mariano Beltrame, to wear masks, in specific operations, such as hostage rescue and demonstrations, although the face-masks have been banned in Rio for the last twenty years. Mrs. Martha Rocha (PSD), chairman of the Public Safety Commission of ALERJ, believed that the action did not seem consistent with Beltrame’s police pacifying project (UPP). Pehkx Jones da Silveira, Undersecretary of Education, Promotion and Prevention, said that from the research conducted there needs to be more focus paid to how police coexist with citizens. “Research conducted has identified the need to further invest in strategies that strengthen the bonds of coexistence and citizen security among the public security operators and the community where they work,” said da Silveira.